I have something of an obsession with titans, and these beasts are undoubtably some of my favorite models from the 40k universe. I currently have two, a Reaver and a Warhound, with the goal of slowly working up to a (small) titan maniple. I’ve painted them in the scheme of Legio Ignatum, a.k.a. the Fire Wasps. 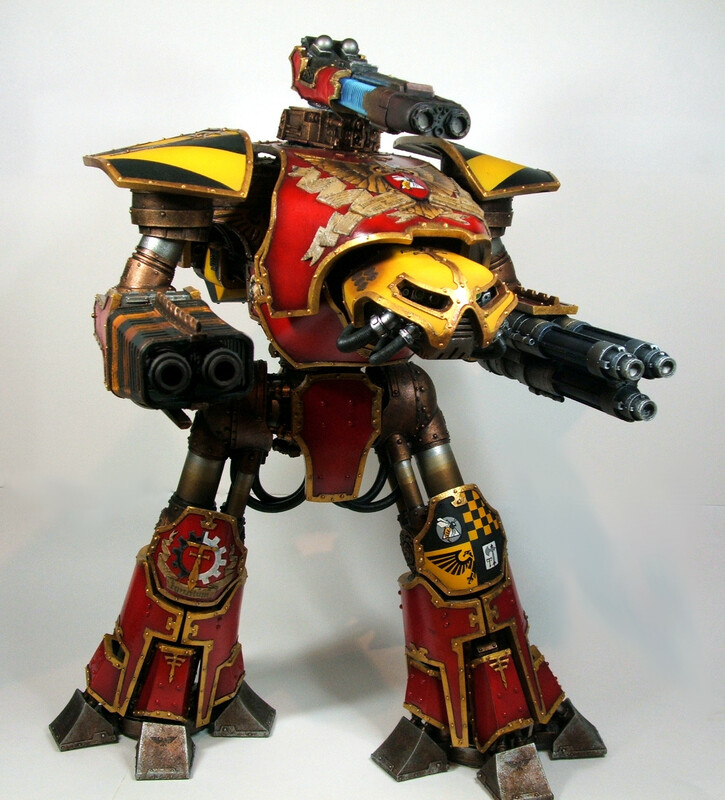 I’m also planning to add some more Imperial Knights to the collection as well. This looks amazing! With Adeptus Titanicus arriving I want to do Fire Wasps my self. Could you please tell what colors you used (brands) on your titan, especially the red and yellow? Hi! So sorry for my late response. The paints used are mainly tamiya. The red is done by first painting the panels black and then airbrushing over this with white. The panels should be mostly white with black around the edges and in recesses. Then, airbrush on several thin layers of tamiya clear red. The red will cover the white beneath, while the black will act to shade it. I think there’s a tute on my blog regarding this technique. It’s also done in the forge world modelling masterclass book. The yellow is just tamiya flat yellow, built up with an airbrush over several layers over a black base. Then, serephim sepia and druchii violet were airbrushed over the edges to give some shade.